The Men's Basketball program picked up its 4th commitment today, this one a PG and a teammate of the guy we signed yesterday at Paris Junior College in Texas. As far as anyone knew, BG had only 3 scholarships available (Black, Sealey and Edwards) so something else is going on. Either somebody is a walk-on or another player won't be back or won't be back on scholarship. I've heard nothing, so we will wait and see. The young man is named Jovan Austin. He's the second JC point guard BG has brought for next year. BG had everyone back at guard, so I think these recruits reflect an assessment of our guard play and play at the point in particular. For Paris, Jovan Scored 9.9 PPG on 46% shooting, with 2.8 assists per game. He started all 31 games. He had 27 assists in the team's last 7 games, so he could have been improving as the season went on. Jovan attended Angelo State out of HS. He was the freshman of the year in his conference. He averaged 12 PPG and 3.5 assists per game. He was a 79% FT shooter. Helped to lead the Warriors to a 35-3 record and to the District 7-5A Championship... Named the District 7-5A Offensive Player of the Year and helped team to the regional championship game. One last note...his shooting % improved a lot at Paris, for whatever that might be worth. Welcome to the Falcons, Jovan. The third commit is indeed a JUCO PF, as BG looks to construct an inside game for the 14-15 season. His name is Delvin Dickerson. He played most recently at Paris Junior College, which is not in France. It is in Texas, located between Dallas and Arkansas. According to their website, they regularly put 5-6 players in 4 year colleges to play ball. Also, his coach there was Chuck Taylor, who had a shoe named after him. They were 26-8 last year and won the Region XIV conference tournament. Dickerson scored 11 points a game. He shot 47% from the field, averaged 4.5 RPG. He committed only 77 fouls in 30 games. Dickerson led Westbury Christian to a 37-2 record last season and a runner-up finish in the Texas Association of Private and Parochial Schools state tournament. The Wildcats and head coach Russell Carr are ranked No. 47 in ESPN.com’s Preseason POWERADE FAB 50 Rankings and have won three state titles in the last six years. As a junior Dickerson averaged 17.8 points and 11.0 rebounds and was named MVP of the 71st annual Houston ISD Boys Basketball Tournament in December 2010.WCHS defeated two-time defending 4A champion Houston Yates in the final behind 25 points and 12 rebounds from Dickerson. Obviously, a guy with D1 ability who fills a need in BG. He very well could end up starting for BG. Welcome to the Falcons, Delvin. And now there are two. Worrell is a 6'8" PF from Tuscaloosa, AL. He is a soon-to-be HS graduate and will be eligible in the Fall. Worrell touched off a mini-firestorm of recruiting interest when he sought and received his release from Appalachian State after they fired the coach who had recruited him. Various internet sources indicate offers from WKU, Illinois State, Stephen F. Austin, Loyola-Chicago, Tennessee Tech, Tulane and Monmouth. So clearly, considerable D1 interest. From a local paper, here are some pertinent numbers. Worrell missed one game while playing four seasons for Sipsey Valley coach Kevin Austin. Worrell averaged 13.9 points, 11.4 rebounds and 2.8 assists as a senior and helped the Bears to a second-straight 20-win season. He was a second-team All-State selection in Class 3A. Two things here. First, he looks like he has the potential to be a very good player for us. Just as importantly, he fills a need. With just Holmes, Gomez and Mayleben returning, BG is very short on inside guys. (Parker is really a 3 at best). So, Worrell can get minutes right away and if he is productive, he makes a big difference. Would not surprise me to see BG get another inside guy via JUCO or Prep with the final scholarship...but that remains to be seen. Welcome to the Falcons, Rasheed. The third and final Men's Basketball Assistant has joined the fold...he is Corey Barker. Corey was an assistant for two years at Arkansas State, during which time they had 38 wins. Prior to that, he was an assistant at Paris JC in Texas (no, not THAT Paris) and before that he was a HS assistant in Houston, which is where he is from. He played his college ball at Prairie View A&M. One of the key skills of an assistant is to develop players...with that, I quote from the BGSU release. At A-State, Barker helped to tutor Kirk Van Slyke and Melvin Johnson III. Van Slyke was named to the 2013-14 Sun Belt All-Conference Second-Team and was named to both the all-league second-team by College Sports Madness and to the National Association of Basketball Coaches (NABC) All-District 24 First-Team. He was also a recipient of a SBC Academic Honor Roll Award, while Johnson III garnered third-team all-conference accolades and was also chosen as a College Sports Madness all-conference third-team performer. Welcome to the Falcons, Corey. Wanna thank my parents, coaches & close friends on helping me make this decision, I honestly think #BG is the best fit for me overall. The Jans Era has its first verbal commit, today, based on the internet. His name is David Joseph, a JUCO G from Howard College, which is in Big Spring, TX. He is listed as a PG on verbalcommits.com. He appears to be an excellent player...he scored 13 PPG on 49% shooting and added 6.3 assists per game. That assist total is #12 in the country for Junior Colleges, Division I. Howard had 24 wins last year. According to this story, Joesph grew up in New York and moved to Florida when he was in HS. He attended Zion Lutheran Christian, which is near Boca. It is a small school (he played in Florida's smallest classification) but he was putting up some sick numbers. As a Junior, he was plugging at 28.6 PPG and 10.6 Assists per game. He is 6'0" tall and comes to BG as a junior. For the team, a couple of upshots. First, it was no secret that BG had struggles at guard last year and at PG. Part of that was Orr and Denny being injured. Part of it that was just a lack of consistent productivity from the guys we did have. I actually think it is possible that Jehvon Clarke is better suited to be a 2 as opposed to a 1. If Joseph can run the point, I think Jehvon can produce off the edges and get to the basket, which is something he can excel at if he has the space to operate. I know some people are going to be disappointed that he is a transfer. A bunch of MAC teams are getting transfers, though, and some (like UT) have built their program around them. If Joseph solidifies BG on the point, it could make a difference remember, remembering that while we are all frustrated at the state of the program, this was not a 4-28 team. In fact, it would not surprise me to see at least one and maybe both of the remaining scholarships go to D1 transfers. There are a ton out there. It is late, and if you are looking at guys who are HS players but projects, they aren't going to help you for a year anyway. Anyway, welcome to the Falcons, David. Update: About 4 pm Joseph tweeted that he had signed his LOI. Update II: BGSU has a release up about the signing now...here are some details about prep school and other play. At Nia Prep in 2010-11, Joseph averaged 13.3 points, 5.5 assists, 2.5 rebounds and 1.9 steals per game, as his team went 26-8 overall on the year and made an appearance at the National Prep Championship in Connecticut. For his strong season, Joseph represented the New Jersey Boys Team in the 2011 JCCS Schoolboy/Schoolgirl Classic that season. Joseph signed with Utah State University-College of Eastern Utah out of Nia Prep where he redshirted his freshman year in 2011-12 before transferring to Howard College. Also, we should apparently be calling him "Pepe." So, welcome to the Falcons, Pepe. So, this has been going on for a few years. I keep it going...not sure why. Hopefully, we can retire this. Look, since the WVU debacle BG has only had a couple winning seasons, and the primary theme is the lack of getting consistent high quality players. Below is a year by year listing of BG's recruiting classes for men's basketball. It contains both players who did not stay and players who did and failed to rise much above average. Both graduates this year are from the 10-11 class: Cam Black and Craig Sealey. One player (Oglesby) already graduated and another (Henderson) has one more year. Black was a good player and Sealey was a role player at his best who never emerged into a larger role. The best class , in my view, is 05-06, with Marschall, Moten, Samarco and Clements, three of whom who formed the core of a MAC regular season title team. This was a Dakich class. The 08-09 class was the best Orr class, with Calhoun, Thomas and Dee Brown. And you see what I mean. Anyway, without further delay, here is the annual update of the recruiting scorecard. Raheem Moss--26 games, two starts, 66 career points, left program. Contribued at Cleveland State. Anthony Henderson-As a R-JR started 31 games and average 10.4 PPG on 40% shooting. Jehvon Clarke--Started 32 games as a JR. 12ppg on 36% shooting. Chauncey Orr--Team's 3rd leading scorer as SO. Redshirted due to injury. Richaun Holmes--All-time leader in blocked shots. Third team All-MAC. Spencer Parker--24 double-digit scoring games as a sophomore. JD Tisdale...Played in every game. Some highlight drunks...hopefully shooting improves. Happy Easter to the Falcon Nation. Regardless of your religious faith, we can all unite around the idea of a new beginning. One happens every day. We continue to get word from outside BG about who the new assistants will be for the men's basketball program...in this case, we are seeing that Mark Downey will join the staff, according to the Charleston Daily Mail. Downey was an assistant to Jans during his one year stint at Independence Community College. According to the story, they maintained a relationship and Downey considers Jans a mentor. Last year, Downey was the head coach at West Alabama, a DII school. They were 17-11 last year. Prior to that, he was coach at Arkansas Tech and University of Charleston, his alma mater. The winner of two Gulf South Conference championships while at Arkansas Tech and a six-time coach of the year winner in nine seasons as a head coach, Downey comes to UWA from the University of Charleston. In only three seasons at Charleston, he compiled a 60-28 record and led the Golden Eagles to their first NCAA Tournament Appearance since 2001. In nine seasons at Charleston (2010-2013), Arkansas Tech (2006-2010) and Independence Community College (1999-2001), Downey is the owner of a 187-92 record. He has averaged just over 20 wins per season and has just one losing season. He has a 19-5 record in post-season NCAA Division II conference tournaments. Downey has coached in eight conference tournaments, reaching the finals five times and winning three conference titles. Among 30 all-conference players that Downey has coached, six have been conference players of the year, four conference most valuable players and four freshmen of the year. He has had 40 former players go on to play professional basketball. Along with Independence CC, he has also been an assistant at University of New Orleans, Marshall, and Barton College. He also played a UK player in the film Glory Road. Welcome to the Falcons, Coach. Just a quick update, courtesy of the Sentinel. You will recall that Bernard Edwards had opened up his recruiting a few days ago...this was a little different from when that normally happens because he had actually signed a NLI. In fact, he was the only recruit to sign with Coach Orr in his lame duck year. To answer your questions, I have no idea whose idea this was. Jans has 3 scholarships now. The signing period actually starts today and runs through May 21. Best of luck to Bernard. According to the Terre-Haute TribStar, David Ragland will be coming to Bowling Green as a men's basketball assistant. Ragland is currently an assistant at Indiana State, where he has been for four years. Before that, he was a head coach at Vincennes University in Indiana, which is an Indiana junior college. He was successful (44-19) and in that manner, has a background a little bit like Chris Jans. Indiana State has seen success during Ragland's time there...they did not have a losing season and they won the Missouri Valley title and played in the Big Dance...all things we'd love to be able to say about our program. His wife has family "near" Bowling Green and he says he has recruited Ohio successfully. Early in the season, a big anomaly was emerging....MAC teams were having a hard time winning on the road. "It's hard to win on the road in the MAC." And indeed it was. Not just in the MAC, in fact, but in all of college basketball. Which is why it was notable when, early in the MAC season, the road teams were winning 53% of the games. That was dog sleeping with cat territory. Well, it didn't end up that way. Remember, we're talking MAC games only. In fact, the home teams ended up winning 59% of the games, which is not great, but it is in a normal territory. Two years ago, MAC teams won 67% of the games at home, last year it was 56% and this year it ticked up to 59%. From the point when I wrote that post, MAC home teams finished the year winning 63%. Two MAC teams...Ball State and CMU...threw a bagel on the road. Four teams, (BG, Kent, EMU and NIU) won 3. Only two teams, (OU and WMU) won more than 5 of the 9 games on the road. UT--undefeated at home--was 5-4 on the road. Here's one thing I wonder. The Wall Street Journal article above talks about the variation in schedules as a factor in a burgeoning home court advantage. The MAC has started to go back to a more consistent Wednesday and Saturday routine. I wonder if that is helping the road teams out--the idea being that a Thursday-Saturday set is tough on the road team playing Saturday. I did a post-Spring report on Saturday Edge, going through a series of questions on how the defending MAC Champion Falcons will fare in '14. Check it out...going to be a very interesting year. Thank You Bill Frack, Again! BG Men's basketball simply doesn't have a bigger fan than Bill Frack. I mean, look. When they name a cookie after the guy...you know you are important. 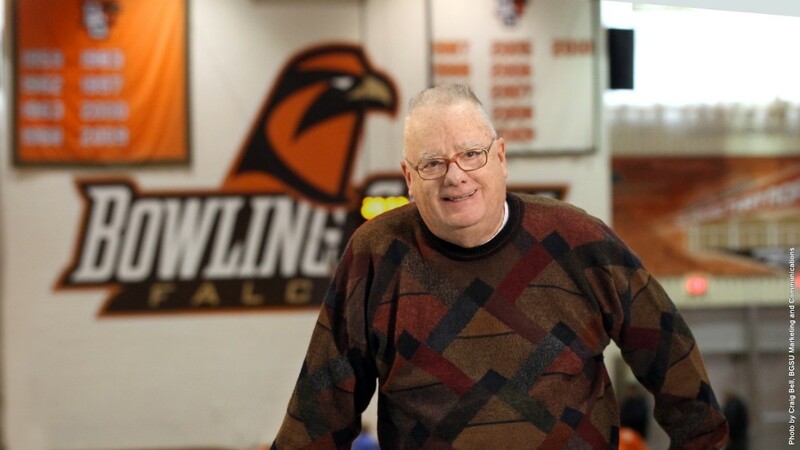 In 2011 announced a $10M endowment to benefit BGSU men's basketball and Findlay area charities. In 2014, donated $700,000 to allow BG to increase the salary pool and hire Chris Jans. Today, announced that the value of the 2011 endowment is now worth $20M. The BG press release states that the endowment will provide $675,000 to the men's basketball program in perpetuity. 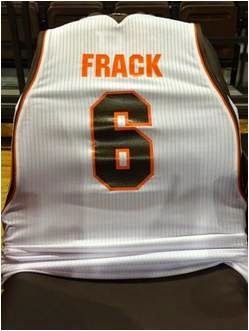 "Many of my fondest memories revolve around BGSU basketball," Frack said. "I want to give back to the program that has meant so much to me and to the community I've called home." Obviously, all of us who also love men's basketball and have so many fond memories (myself very much included) owe Bill Frack a huge debt of gratitude. His support has meant a great deal already and will continue to help the program compete literally forever. I have never met Bill Frack but I am told that he is a warm and humble man. He certainly has not sought undue attention for his efforts. I am proud to support the same team that he supports and proud that he is involved with my alma mater, a place that I love. So, the news today for men's basketball is that Bernard Edwards, Jr. is reopening his recruitment. Edwards actually signed a LOI back in November, so if he is going to go somewhere else, I would assume he is going to need a release. Also a caveat, sometimes guys re-open and then stay where they were committed in the first place...and there has been a coaching change...anyway, we will watch and wait. Overall, I did pretty well this year...I picked us to go 11-19 (not including final Cancun game and MAC tournament) and 6-12 in the MAC, and BG went 12-18 and 6-12. We will see in a minute if I just ended up right by being wrong, but in general, this was the season I expected. As I mentioned several times during the year, the team did exceed expectations in some ways. There were a bunch of close games and a couple nice wins. But, in the end, they finished where you would have expected. Anyway, that's how it totals up. Earlham is a DIII team that was 4-21 last year. BG threw away this game last year in Tampa. This year, the Bulls are not very good again but brought in a huge FR C and should beat BG. "Blue Hose" are picked to be last in the Big South. They are likely to be BG's first DI win this year. The Hilltoppers were 20-16 last year and bring four guys back. They were in the tournament last year. On our court, this one has a shot but this is an unlikely win. The No Nicknames beat BG last year on their home floor. They are picked to be 2nd in the Big Sky and have uber star Troy Huff. He dropped 14 and 12 on BG last year. I'm going to take a shot and say BG wins this one on home floor. Bunch of new faces for Morehead. I'd say that this is a road game BG could steal but I see us struggling to win on the road. Detroit has a bunch of new players, has to replace Ray McCallum and also had Jason Calliste transfer at the last minute. BG won this one at the Stroh least year. Wright State went on to win 20 games and could win the Horizon this year. Tough game for BG on the road. Mastodons beat BG in bracket buster in Ft Wayne last year. Frank Gaines, who popped 26 on the Falcons last year is gone and BG should win this one at home. This one could be close, but I will take BG on home court. NIU is expected to not be very good. I would think BG also wins this on home floor. Quick note here. The opening part of the schedule for BG is crazy easy. Three of the worst teams in the MAC, all at BG...and Miami in game 6, also at home. BG's last 12 games are all losable. BG could compete with Ball State and Miami--but both those games are on the road. Buffalo and Kent at home are not unwinnable. But, BG could easily be an underdog for every one of there last 12 games and a 12 game losing streak to end the season is not outside the realm of possibility. Paul and Hutcherson are both gone, but the Broncos good enough to win this in K-Zoo. Ohio may take a step back but the Bobcats will be tough to beat at home. Miami still in a rebuilding mode. Eagles even the score at home. I don't know. The media doesn't seem that high on the Bulls but they have a lot of guys back and are Witherspoon-free. Take BG but its close. The Rockets bottomed out and now are among the conference elite. Akron still too strong for Falcons. No chance at the MAC. This one is winnable. However, on the road, Ball State will be favorite. Can BG win on the road this year? This might be the best shot. No chance at the JAR. There was one player who was getting some touches in the Spring Game yesterday that I did not recognize, and that was #25--John Klingerman. He isn't listed on the roster or in the Spring prospectus and I am not familiar with hearing his name before today. He's 5'9" and a WR in the Burbrink mode. He had 4 grabs for 25 yards in the game. He comes to BG with an incredibly productive career as a HS player in Bloomsburg, PA, which is over in the Eastern part of the state. Young man set up his own website for recruiting purposes. His website says he graduated last June from HS. I don't know anything else. I assume he's a walk-on. I don't know when he enrolled at BG. Who knows what can happen? Ryan Burbrink started as a walk-on, too. We are deep at WR...but he did get some work today. Anyway, if you wondered who that was, that's who that was. So, the Spring Game was played today under Sunny skies. It was chilly, but frankly we have had much worse weather in the past..especially for a game this early. The wind was manageable...it was actually a very enjoyable day to be at the Doyt. 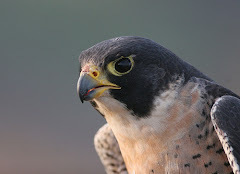 I missed the first few minutes thanks to a traffic jam on 475 (#falconstop), but what I saw was fun. It was our first time to get a look at the Dino Babers #Falconfast paradigm in the Stadium. It was very interesting...we seemed to have two paces....hair-on-fire fast and just fast. Anyway, in a Q&A format, here are some impressions. Q: What did it look like overall? A: Overall, the 1s were matched against the 2s and the 1s won and it wasn't close. You wouldn't expect it to be and you'd worry if it didn't end up that way, so I am pleased to report that the 1s had their day. Q: Coach Babers said that all the positions were open. Do you think Johnson is the 1QB. A: In Falconfast parlance: "Come on, now." A: Thought the #1 Defense looked good, given the players they lost and without Gabe Martin. Solid tackling, strong coverage..again, playing against the #2, but they dominated the #2. Forced turnovers, 4th down stops. Nice day. A: Not going to be a problem. Gehrig Dieter shredded the #2 DBs and Roger Lewis made nice catches. Redding and Cobe also contributed, as did Burbrink and Jackson. Going to be deep and talented. (Note: Moore, Cohen and Gallon injured and DNP but expected back). Q: Can William Houston play in the Babers offense. A: Yes. OK? Relax. He got a number of carries, chewed Adjei-Barimah up on one carry. We even have a "power set" which includes a blocker in the backfield. Q: How did the RBs look? A: Good. Greene and Houston got a lot of work, but Brandon English scored and Givens and Harrell got carries. Coppet was a DNP due to injury. I believe we have depth at RB. A: Former QB Austin Valdez is now a LB and had a sack and tackled Houston. Q: How fast was it, really? A: We ran 69 plays in the first quarter...that's BOTH offenses, and without special teams...you get the idea. Still, you could get 100 plays in a regulation game at that pace. A: I think we had more turnovers then we'd like to see. We had a few false starts and trouble inside the 5 one time...something Falcon fans remember from our previous days with the spread offense. I don't think any QB but Johnson played well. There was probably more pass rush on Johnson than you would like to see. Also....we have a guy named Zappa. Which makes me happy. OK...if you just cannot wait for the start of Falcon Football...if you want #falconfast to be here just A LITTLE BIT faster...then OK. You've been saved a day. Western Kentucky has announced that the BG-WKU game will now occur on Friday night, August 29 at an unknown time, presumably in the evening. The announcement says that it was done to accommodate the television partners of the Sun Belt Conference. Whatever that means. The other news is that BG has its first two verbals...and they are from Australia. They are Dylan Harrison and Elijah Sinapati, both from Queensland. They were "discovered" last year at the Gridiron Australia Future Stars Camp on the Gold Coast. Elijah (6′ 5" and 310 pounds) and Dylan (6′ 7″ and 336 pounds) and were assisted in their recruiting by Paul Manera, who is the coach of the Australian National team. nearest to Papua New Guinea. Manera played his college ball at Hawaii a couple of years after Babers left...no idea if that is the connection. Anyway, the only better thing would to hear Dave Clawson spend signing day contorting Australia into the State of Bowling Green. Let's just agree on this...the Babers era will not be dull.